Although the loco moco may be the most classically Hawaiian way to eat a hamburger patty, Honolulu has an excellent and diverse array of burger options. There are so many, in fact, that we did you a huge favor, tasted all of them, and rounded up the best options (yeah, it was a real sacrifice). We tasted everything from Honolulu's most high-end, seasonal, gourmet burgers to local classic diner burgers, from simple toppings like lettuce, tomato, and onion, to brilliant, crazy options like soft shell crab and chipotle-cranberry sauce. In the end, our list ended up being a mix of different burger styles, but we selected only the best of the best to share with you (yeah, you're welcome). This burger joint is the ultimate hidden gem: tucked under a freeway overpass, on the ground floor of an apartment building. Once you find the place -- you’ll know you’re there when you see the Welcome to the Bat Cave floor mat -- the hard part will be making your selection. The burgers here are made even better with fun names -- "I Came in Like a Butterball" is a turkey burger braised in a chipotle and cranberry sauce, and "Doe a Deer" features Maui venison braised in bourguignonne sauce, and topped with pineapple chutney. If you're craving a classic, however, go with the Juicy burger, which is braised in homemade jus and served on a toasted bun, which you can amp up with bacon or a selection of cheese. B&T claims it's "Dripping down your elbows good," and yeah, we have to agree: this burger is the definition of calorically #worthit. Plus, this is one of few burgers we can actually recommend ordering to-go. They pack the buns in a separate container, so when you assemble your dinner, the bun isn't soggy. Genius. Juicy burgers, cereal milkshakes, and hip-hop, all one place: Franky Fresh is basically our idea of heaven. At this '80s hip-hop-themed burger place, you can peruse the menu (printed on recycled vinyl records) and choose from burgers with names like "The Fresh Prince," "Notorious P.I.G. ", "Guru Veggie," and "Ghost Fish Killa." 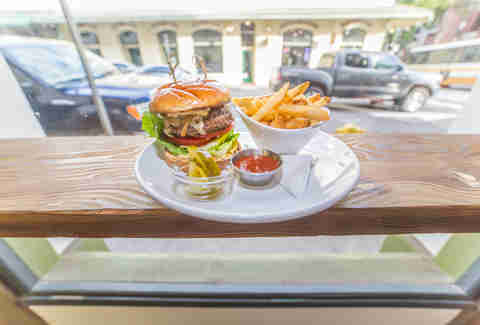 The classic "Old School" burger is a great place to start, made with grass-fed Big Island beef and topped with lettuce, tomato, onions, and Franky Fresh sauce (a garlic aioli), served on a sturdy challah bun. It comes with a bucket of crispy fries (or a salad… but come on, fries! ), and you can choose from dipping sauces ranging from roasted red pepper, garlic aioli, wasabi, and spicy mayo. Huge bonus: after dinner, you can relive your childhood and exercise your opposable thumbs with a game or two of Mario Kart or Street Fighter II on the Super Nintendo. And if you still have space, top it all off with a Cap'n Crunch milkshake. Inspired by co-owner Hideo Simon’s college days, this beer-and-burger bar takes his love of the ultimate college dinner to the next level: we’re talking over 20 beers on tap, and burgers made with fresh, house-ground local beef. Try the signature Drive-Thru burger, a simple patty made with 3.5oz of ground beef, topped with lettuce, tomato, pickled onion, and cheese on a sesame seed bun. Extra patties, bacon, fried eggs, or truffle butter can be stacked on for optimal enjoyment. All burgers are served with fries cooked in your choice of rice bran oil or pig fat, depending on just how much extra animal fat you need that day. Stop by the quality happy hour for the peanut butter & jelly burger, when it's just $7. When you want what can only be described as a designer burger, grab a seat in this newly renovated, seasonal American restaurant. The Chaz burger is available for lunch and dinner, and while it's the only burger option on the one-page menu, it delivers with a meaty blend of short rib, chuck roast, and brisket, creating a magically juicy ground beef patty supplemented with caramelized onions, Naked Cow cheese, local tomatoes, roasted garlic aioli, and house-made ketchup on a brioche bun, served with bread-and-butter pickles and fries. If you go with friends, be prepared to barter a bite or three. Although this island favorite restaurant is a mainland-based chain, the Kahala franchise serves Big Island beef, along with its signature build-your-own-burger options: you want jalapeño jack cheese, Korean barbecue sauce, and grilled pineapple? You got it. Math wizards have calculated that over 300,000 options are available, so making your selections may be a tad overwhelming. Start out by customizing your burger slowly, and follow your mom’s accessorizing advice: add four things and take off two, and your outfit (ahem, burger) will probably look (and taste) all the better. If you’re looking for a no-frills, classic burger, head to this walk-up eatery, which has been cooking up the same recipe since opening 75 years ago. Soaked in secret teriyaki sauce, this local-style barbecue burger is salty and slightly sweet, marinated, and not overly saucy. Order your burger royal-style with everything, and you get a flame-grilled patty crowned with cheese, tomato, lettuce, and onion on a plain Love’s Bakery bun. 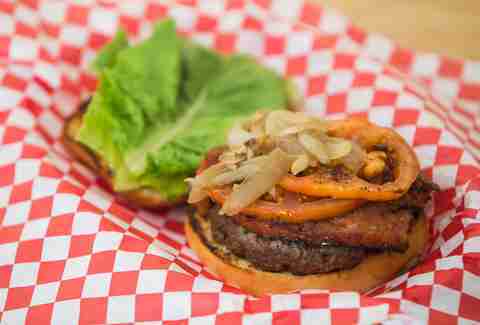 As gourmet burgers continue to pop up around town, this burger embodies the phrase "if it ain’t broke, don’t fix it." Five years ago, former nightclub owner Ken Takahashi brought free-range, grass-fed Big Island beef to Honolulu, constructing his burgers with island-grown ingredients. 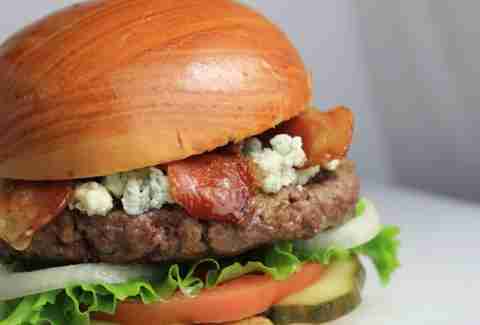 Treat yourself to Honolulu Burger Co's best seller, a hormone-free patty coated in crumbled blue cheese, bacon, and house sauce soaking your choice of Kaiser roll, whole wheat, sweet bun, or taro bun. The 1/3-pound burger can be filling, so bring some local beer to this BYOB joint, and wash down your meal with some cold barley and hops. Hit up this local chain for messy, charbroiled, made-to-order patties. 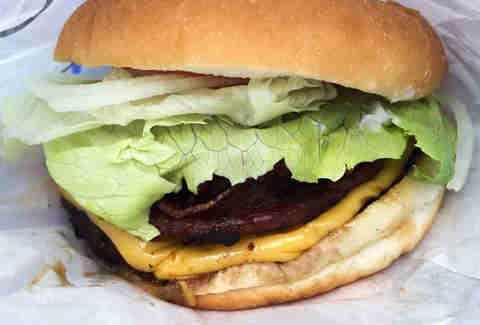 This Hawaii-based burger joint first opened in 1998, and has expanded to cities worldwide. The burgers start at 5oz, a happy medium is 7oz, and those who are feeling really meaty can opt for the 9oz Biggest Burger. While Teddy's offers specialty burgers like the Slaw Daddy or Kilauea Fire, first-timers should get to know the place by its original burger, topped with secret sauce on a signature potato bun. After downing a combo with garlic butter fries and a drink, clear your schedule, because a nap is in the cards. If you want to grab a burger at this coffee shop (and you do), you’ll have to plan carefully… and stalk its social media accounts. When the first-come, first-served Burger Nights started popping up once a month, word of its Big Island beef burgers slowly began spreading around town. Then Burger Night disappeared for a bit, only to pop up every once in a blue moon. But if you don’t want to wait to wrap your hands around its Good Burger, you’re in luck: on Fridays and Saturdays, come for lunch before the popular patties sell out, when you can try the signature burger, made with grass-fed Kulana beef, capped with tomato, arugula, and spicy mayo, served with a choice of shredded cheddar, Gruyere, or provolone cheese on a soft ciabatta bun. Get it if you can. Although this roaming pop-up eatery boasts more than just burgers (we strongly recommend the bacon-wrapped hot dog), its hormone-free local beef burgers hold up against some of the city’s top gourmet patties. Find it at farmers markets, or the monthly Eat the Street food truck rally. It caramelizes sweet Maui onions, then piles them high on a beef patty with Gruyere and blue cheese, roasted garlic aioli, and smoked applewood bacon, and serves it all up on a toasted taro bun. 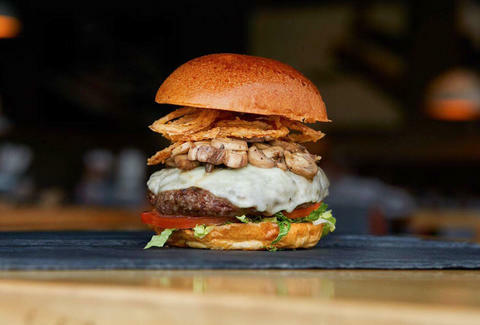 This gastropub has just one burger on the menu, but it’s the only option needed. 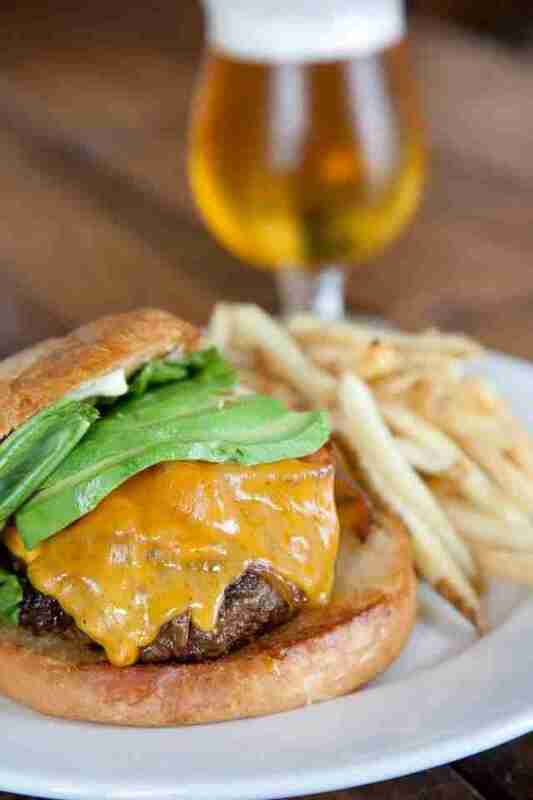 Often touted as one of the best beer bars on the island, its burger is, fittingly, all about beer. Made with local, grass-fed ground beef and mixed with oatmeal stout, the black-and-tan-inspired patty is hand-shaped to a generous two inches, and covered with melted, house-made beer cheese, garlic aioli, and butter lettuce, served on a toasted brioche bun. To make the burger "more expensive," as the menu calls it, toss on avocado, caramelized onions, or thick, hand-cut bacon. To say that it’s surprising to find a quality burger in a mall food court would be an understatement. But this fast-food joint’s burger is genuinely something to write home about. 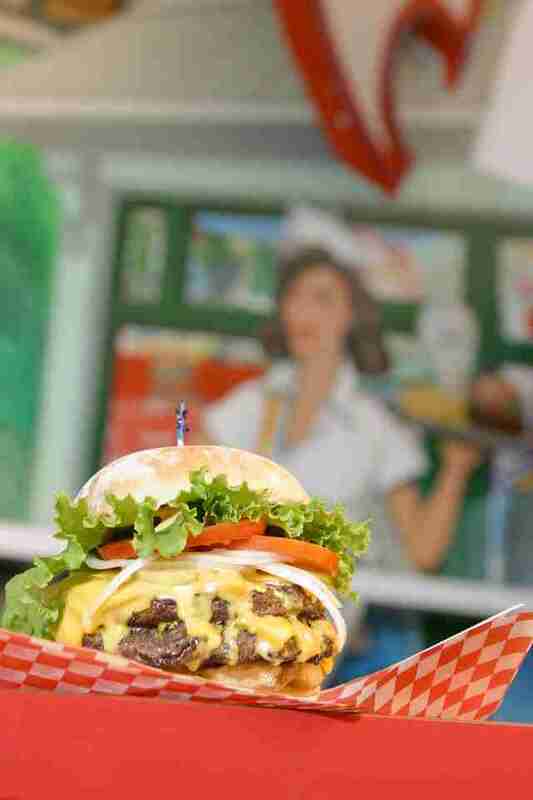 The patties are prepared daily, filler-free and never frozen, and made from Big Island beef. Try the twist on local comfort food: a 1/3- or 1/2-pound patty topped with crispy onions, brown gravy, and a sunny-side-up egg on a bun that's been grilled with caramelized, whipped butter. If anything can make going to a mall worth it, this is it. When you’re in need of surf & turf on a bun, head to this café for a double dose of protein: the beef patty gets stacked with crispy soft shell crab, avocado, chili aioli, and locally grown lettuce & tomato piled so high, you need to hold it with two hands. This outdoor café and catering company is only open from Monday through Friday from 9:30-2:30pm, which means you may need to schedule a long lunch to satisfy your burger cravings. When it’s time to treat yourself, take your taste buds to this Downtown eatery for one of the most expensive burgers on the list. Though only a year old, the sister restaurant to popular ramen shop Lucky Belly is home to one of the best burgers in town. Its namesake burger is just about perfect: the patty is thick and juicy, topped with bacon-onion marmalade, melted Gruyere, frisee, and tomato, and held together with a homemade Kaiser roll. 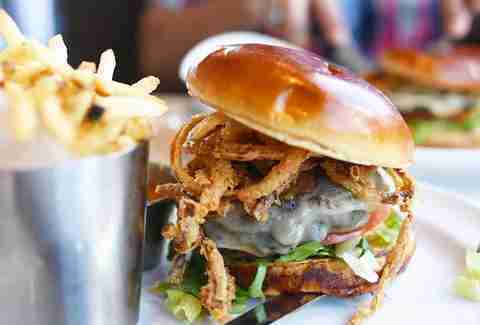 Coming in at $16 a pop (with a substantial pile of fries), this burger is meant to be savored. Although the dishes change quarterly, luckily, it looks like this baby will be sticking around for the long haul. And by long haul, we mean the journey from the plate to your belly. Summer Nakaishi is a freelance writer for Thrillist, who needs a nap after all these burgers... and a milkshake. Definitely a milkshake.